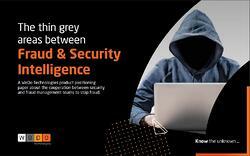 Do you know the thin grey areas between Fraud & Security Intelligence? Our world can feel insecure. Though glossy advertising tells us technology will enable a carefree, safe and luxurious lifestyle, there will always be negative forces lurking in the shadows. The best way to defeat those forces is with superior intelligence, as also powered by technology. Nobody knows this better than the fraud managers who work for telcos. Whatever security precautions you implement, criminals will work tirelessly to circumvent them. If you feel safe from fraud, then you are more likely to fall prey to it, whilst if you feel paranoid about fraud... then you will still be at risk anyway. Download this ebook today and learn why fraud managers need the same skills and gadgets as other intelligence agents.